Hostmaster Review 2019: Is Hostmaster a Good Hosting? Israel-based Hostmaster is a free domain registration and web hosting company that targets small business owners and individuals. They have been voted one of the best free site-building and storage companies for ten consecutive years. 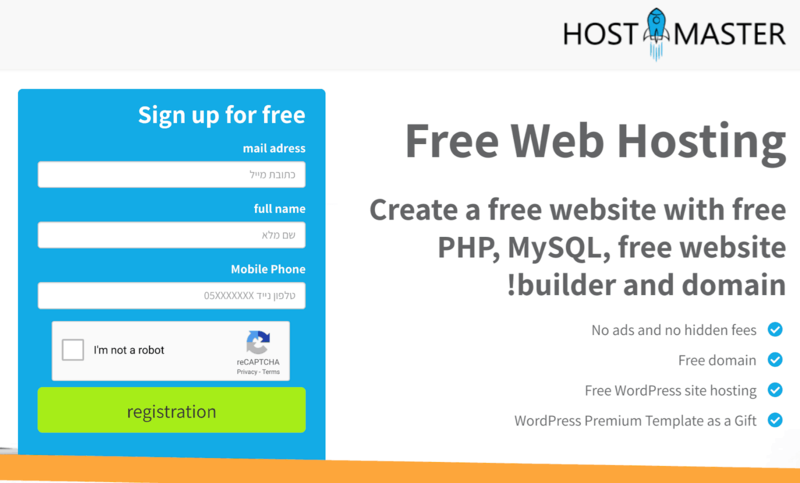 Hostmaster is an Israeli hosting company that offers free domain registration and a free web hosting platform. Their portfolio of sites suggests that they target mostly individuals and small businesses, which is hardly surprising for a free provider. They have been voted one of the best free site-building and storage providers for ten consecutive years. Hostmaster has been around for a long time, so they clearly know what their customers want. I’m baffled about how they actually make money, especially since they seem to have excellent hardware. For next-to-nothing, you get good performance and a good 99.9% uptime guarantee, so you can trust them with your HTML/PHP or WordPress website. I also love the fact that customers get the user-friendly cPanel control panel that makes it easy to manage every aspect of your hosting. You can add domains, create emails, and set up your MySQL databases from one central place. You’ll soon see that it’s so easy to navigate and configure security settings too. The icing on the cake has to be their free website builder tool. I haven’t explored it in any great detail, but I can conclude that it has a drag-and-drop interface and comes with many modern templates that can be customized for particular websites. If you want to build a CMS site, you can make use of their WordPress Premium Template that is included as a gift. While working my way through Hostmaster’s website, I couldn’t see any sign of prices at all. This might sound obvious for a free hosting provider, but we all know that if something looks too good to be true… it probably is. But unlike other free providers, this one doesn’t inject adverts into your websites or charge any hidden fees, so I have absolutely no idea how they actually generate revenue. However, I do know that I love the idea of a truly free web host with a truly free website builder. While I couldn’t find any self-help tutorials on their website, you can always reach out to their responsive and friendly technical support team by email. Hostmaster is worth considering if you’re looking for an Israel-based free hosting service for your personal blog or simple business website. Wondering how Hostmaster stacks up against other Web Hosting companies? Enter any other Web Hosting company and we will give you a side-by-side comparison.